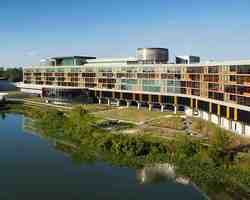 Looking for Package Deals to Streamsong Resort? We have those too! Surrounded by nothing but nature, Streamsong offers a golf experience like no other resort in Florida. Renowned architects Tom Doak, Bill Coore, and Ben Crenshaw collaborated to create Streamsong Blue and Streamsong Red - considered two of the top 100 golf courses in the U.S. by Golf Magazine, plus the new Streamsong Black, named Golf Week Magazine's Best New Course of 2017. Aside from glorious golf, Streamsong Resort additionally offers outdoor adventures such as guided bass fishing, hiking trails, bird watching and sporting clays. Welcome to Streamsong, a new kind of resort that takes the everyday ordinary to the absolutely extraordinary. A resort where golf is both a quest for perfection and an art form. A retreat that is the ultimate escape for relaxation, enrichment and rejuvenation. A place where the surrounding ecosystems are as deeply valued as the time you’ll spend with Streamsong. The guestrooms and suites at Streamsong are as soothing as they are inspiring. They are the creation of Alberto Alfonso of Alfonso Architects, an award-winning innovative design firm with offices in the United States and Italy. For each of the rooms, Alfonso, an established artist in his own right, created paintings that reflect Streamsong’s natural surroundings of giant dunes, lakes teeming with bass, and the wooded landscape. Streamsong’s guestrooms and suites feature floor-to-ceiling glass with custom louvers and hardware to control light, and the majority of rooms have spectacular water views that extend to the natural Florida horizon. Queen- and king-size beds with sumptuous linens, plush robes, and boutique amenities ensures that no detail is overlooked…every expectation is met.